After patting itself on the back for putting a pause on the “Jubaland” crisis, Somalia and its international partners in IGAD and UNSOM will soon have to address the next federalism row in the country emanating from the Bay region capital of Baidoa. 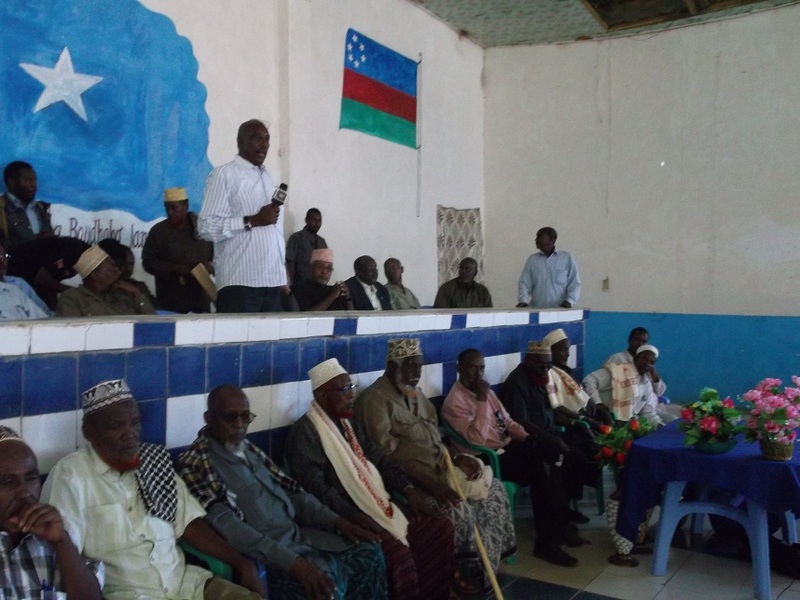 Over the last several months, two competing conferences led by various Digil/Mirifle clan leaders (but involving selected other clans) have taken place in Baidoa to form a new administration called Southwestern state. Earlier attempts to form the state from the early 2000s failed in part because of  internal fighting between Rahanwein Resistance Army (RRA) leader Colonel Hasan Muhammad Nur Shatigadud and his deputies Adan Madobe and Muhammad Ibrahim Habsade and  external (and often competing) efforts to integrate the RRA (one faction under the umbrella of the SRRC) within a transitional government. The current crisis fits the mold of the previous one–though the dynamics of the crisis likely won’t turn as violent as it did years ago or resemble the Kismayo clashes that occurred over Jubaland’s creation. Another camp supported heavily by ex-Parliament Speaker Sharif Hassan Sheikh Adan has been meeting in Hotel Bakiin to form a 3 region state with Bay, Bakool, and Lower Shabelle. Since 25 January 2014, the SW6 camp has approved its constitution and elected Malaq Hasan Shure as Chairperson of the Constitutive Assembly of Traditional Elders that will direct the steps toward electing the Southwestern state president. In early February, SW3 also approved its own constitution–creating two constitutions for the would-be state. Authorities from the Interim Jubba Administration (IJA) such as spokesperson Abdinasir Seerar have continued to claim a futility of Southwestern State including the Jubba region and have suggested a more “feasible” SW3 plan. The SW6 crowd that is dominant at the moment will find it difficult to make its 6 region state a reality because of the weight and recognition (both from Mogadishu and the international community) behind the Interim Jubba Administration in Kismayo and the lack of a mandate from all the requisite communities in several of the regions it seeks to administrate. Therefore, many suspect Sharif Hassan with SW3–though leading a less popular camp among Digil/Mirifle elite–is playing the long game to see his 3 region state plan become more widely accepted and put himself in a position to become regional president. SW3 still would have difficulties receiving a mandate from all major communities in Lower Shabelle–especially since Lower Shabelle and Middle Shabelle leaders have been discussing the possibility of forming their own administration. Thus, how the Baidoa crisis pans out will not merely be a question of how Digil/Mirifle leaders react to the situation. As usual, the roles of many other actors in southern Somalia and, of course, regional neighbors and the international community will be a dominating factor. Sub-clans within the Digil and Mirifle clan have often competed (and sabotaged each other) for control and influence in southern Somalia. But, the historical record of marginalization meted out by other clans (in land, politics, etc.) has created the impetus among the Digil/Mirifle to become a power player through its home territory serving as the capital of a large state in a federal Somalia–a concept voiced first promoted by the Hizbia Digil-Mirifle Soomaaliyeed (Digil-Mirifle political party) in 1947. Rather than fight (or align) with post-1991 warlords or other armed factions to become a bigger stakeholder in a federal state, Digil/Mirifle leaders can make use of the federalism process to negotiate its objectives. Interestingly, both the history of internal rivalries and impact of longtime marginalization are playing out simultaneously in the development of Southwestern state. Ethiopia’s August 2013 negotiation of the Jubaland crisis (via its strong role in IGAD) between Ras Kamboni leader Sheikh Ahmed Madobe and President Hassan Sheikh Mohamud’s close aide Farah Sheikh Abdulqadir amped up Addis Ababa’s role (to the “detriment” of its rivals in Nairobi) as one of the primary outside actors influencing the federalism process in Somalia. Plus, with many Kenyan troops allegedly being replaced in Kismayo soon amid accusations of not being a neutral force, Nairobi’s influence in the Jubba region may be slipping as Addis Ababa’s is rising. If Addis Ababa is again a venue to solve Somalia’s federalism woes, Ethiopia may have to reconcile Baidoa’s most popular aspiration (at the moment) to include the Jubba region in Southwestern state. Notably, Ethiopia in the past has backed several militias (including the RRA) and politicians from Bay and Bakool region in order to exert influence on other stakeholders in Somalia and ostensibly to maintain strategic relations with key actors on its border. This is merely a different version of its domestic political strategy of co-optation. As a result, it will be very interesting to see Ethiopia (part negotiator/part foreign relations strategist) try to  uphold the terms of the Jubba agreement while also  potentially seeking to firm up relations with Bay/Bakool elites it has traditionally sought to support and  acting in any sort of cohesion with its now AMISOM partners in “support” of the Somali government. AMISOM troops in Sector 3 appeared to be fairly neutral for some time as Baidoa elites began planning the Southwestern state process. However, on 30 January 2014, Ethiopian and Burundian troops barricaded the entrance to both SW6 and SW3 conference halls–according to some reports on orders from the Somali government–before eventually giving up its bizarrely-timed siege. In response, there were raucous protests at the scene of the SW6 venue and gunshots (at 2:11 mark possibly from AMISOM to disperse the crowd) can be heard during the incident. The AMISOM blockade highlighted an indecisive shift in how the Somali government and AMISOM have previously dealt with the state formation conferences Baidoa–as before AMISOM was simply standing by and the Somali government was procrastinating on a solution both acutely and more broadly to the Simmering Quagmire also known as Federalism. A big question remains if AMISOM can keep itself from getting embroiled in the crisis as a result of reactionary orders from Somali government leaders. Out of the Somali Government’s Hands? President Hassan Sheikh Mohamud has only addressed the crisis indirectly by tacitly warning Baidoa not to support a process that interferes with the borders of the IJA. There do not appear to be any transparent government plans to deal with the federalism question effectively. At this point, it is unclear what role Parliament Speaker Osman Jawari (a prominent Digil/Mirifle leader) can play in defusing the Baidoa crisis, but it has been reported that he tacitly supports SW6. Even if chooses to become a “neutral” broker, it is unlikely that by himself he can create a compromise–especially if SW6 is further emboldened by provocative actions like the AMISOM blockade. Moving forward, perceptions will increase that President Hassan and his inner circle are anti-Federalist or at least unable to do anything but stand on the sidelines as IGAD and UNSOM take the process into their own hands. UN Special Representative for Somalia Nicholas Kay already has made it clear that regional and international actors will play a key role as the Baidoa situation evolves. This apparent inevitability is merely the latest in a longtime tradition of regional and international actors leading a process that should be hashed out–for better or worse, willingly or unwillingly–among Somali stakeholders inside Somalia rather than led from the outside. In assuming responsibility for “solving” the Baidoa crisis, Somalia’s neighbors are left to seek their own interests and the international community is again removing any incentive for the Somali government and parliament to take responsibility for confronting difficult national issues. Unless there is an indication the situation in Baidoa could turn violent, which at the moment there is not, regional and international actors should likely refrain from heavy involvmeent or else risk only doing a disservice to potentially effective outcomes. One of the most worrying factors is the effort by Ethiopia/IGAD/UNSOM to pause the Jubaland crisis in negotiations was too exclusive. It left out most stakeholders in southern Somalia and only included Ahmed Madobe and President Hassan’s inner circle–thus adding unneeded complexity to the federalism row in Baidoa that at the time was very clearly going to emerge. It can be expected that whatever negotiations that occur to resolve the Baidoa crisis will similarly not involve all the requisite communities–especially since SW6 and SW3 themselves are diverse in representation but not totally inclusive. For instance, if the IGAD/UNSOM-led negotiations with the Somali government and stakeholders in Baidoa eventually endorsed an interim administration including Lower Shabelle, this would fly in the face of other aforementioned efforts to include that region in another prospective state. Overall, the protracted federalism crisis in Somalia is set to occur over and over again in part due to repeated mistakes and lack of foresight on behalf of the international community. Putting the Puzzle Together: What Does the Future Hold for Somalia’s Military Forces? Dellusion of six regions which has never controlled by Rahanwein. How shameful for these leaders will work . Rahanwein has only manage two regions which is Bay and Bakol. How can we accept an adminstration called Jubba and backed by Kenya, can this work in Somalia for the future?. How can a person from Eithiopa can controll Southwest! This is a big questions that is not wisely though. Rahawein live and are the majority of Southwest Somalia, I do now know how Hassan yare (above commentarer) is judging the situaion in Somalia. I think he has no better idea about Southest somlia and which people live there. An adminstration that is imported from Kenya, will not continue to work in Somalia soon! This is the my thinking .